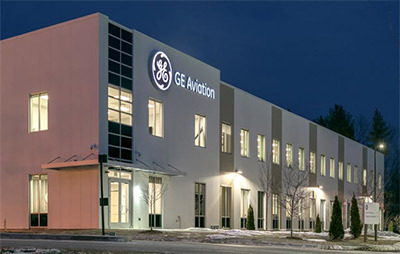 GE Aviation in Hooksett|! !| NH. Growth in the aerospace market is prompting corporations with production facilities in New Hampshire to prepare for incoming orders. GE Aviation and CFM International, a joint company of GE and Safran Aircraft Engines, recently announced they received more than $22 billion in orders and commitments for jet engines, avionics, services and digital offerings in mid-July, at the Farnborough Air Show in the United Kingdom. CFM announced it struck deals with airlines in developing markets, including Hong Kong, Vietnam and Mexico. Deals struck at the international aerospace trade show will have a direct impact on the production line in New Hampshire. Engine orders and commitments included more than 850 CFM LEAP and CFM56 engines, 250 CF34 engines, close to 100 GE90-115B engines and almost 50 GEnx engines, according to a press release from GE. CFM International workers examine a Safran aircraft engine. Safran works with Albany International to produce 3-D woven composite parts in Rochester, NH. In anticipation of an increase in orders, GE invested $50 million in 2016 to expand its Hooksett facility by 65,000 square feet. The Hooksett plant employs nearly 900 people, with additional hires of up to 125 people expected this year and another 75 hires expected in 2019. In a recently released report, the market consulting firm Deloitte noted global aerospace and defense sector revenues grew by 2.7 percent to reach $685.6 billion in 2017. The report also ranks GE Aviation as the sixth top aerospace and defense company by revenue in 2017, with $27.375 billion, and Safran in 10th place at $19.099 billion. “Commercial aviation from 2017 to 2036 is going to be a $6 trillion industry,” said Wagner. Boeing alone anticipates the sale of 41,000 new airplanes through to 2036, he said. And the U.S. military is preparing for significant investments, including upgrading the 414 engine that goes into the Super Hornet and a new engine for the B-52. Any time there is an uptick in military growth, the Hooksett plant experiences an uptick in production, said Wagner. “We make parts for every military engine GE makes … our volume’s up 36 percent this year over last year, and it will be up another 15 to 20 percent next year,” said Wagner. Increased production also means more work for GE’s suppliers, many of which are in New England, with a few in New Hampshire, including Titeflex Aerospace in Laconia. “It’s mostly processes that we offload. We either do it strategically or for extra capacity to have a backup,” explained Wagner. GE’s Hooksett plant produces three key parts for airplane engines: sectors, tubing and blisks. The company, which has been operating in Hooksett since 1966, started with a fixed vane sector assembly, explained Wagner. In 1968, GE entered the tubing business, making air, fuel or hydraulic tubes for all of the different engine lines. In the early 1970s, the plant started producing blisks, a bladed disc used in engines. “We send those to our assembly plants to build the engines or we ship spares to support the 56,000 engines that are flying in the field. We ship about 3,000 different parts,” said Wagner. Since then, the machining technology, inspection technology and robotics have changed dramatically. Robotics keep employees safe and reduce ergonomic issues, explained Wagner. “We have robotics experts that work here and we’re continuing to train our employees about robotics,” he said. The products have changed as well. The LEAP engine is experiencing the fastest ramp rate in the history of aviation, said Wagner. The engine delivers an additional 90 miles per gallon per passenger — a key feature, especially as budget airlines like easyJet and Spirit Airlines pop up. The LEAP engine also consists of new products, including 3-D woven composite parts produced by Sarfran Aerospace Composites and Albany International at their joint Rochester, NH, plant that opened in 2014 in response to the LEAP ramp up, said a spokesperson from Safran. Approximately 275 Safran employees produce 3-D woven composite fan cases and blades for the LEAP engine. “We’re making 20 LEAP-1B engines a week for Boeing. That’s going to be 36 engines a week by the end of next year,” said Wagner, of GE. To prepare for that growth, GE Hooksett has been developing its workforce within the company and through relationships with local schools. Hiring can still be a challenge, said Wagner. GE has worked with both of the community colleges to allow students to work while going to school, and has found success hiring from their programs, he said. “We partner with them very closely,” said Wagner.